The purpose for this event is to get the community together who disapprove of Stephen Harper’s Omnibus Bill C-45: Jobs and Growth Act; Omnibus Bill C-38: Jobs, Growth and Long-term Prosperity Act; as well as other smaller bills that affect First Nations such as, Bill S-8: Safe Drinking Water for First Nations Act, and Bill C-428: Indian Act Amendment and Replacement Act, and also the controversial proposed bill: First Nation Education Act. Some of these bills have affected the Canadian Broadcasting Corp., the Indian Act, the Navigable Waters Protection Act, Old Age Security, charities, environmental hearings on pipelines, border security, employment insurance, fisheries, access to safe drinking water, and government’s Treaty Right obligations and much, much more. This event is about unity, strength, and resilience within ourselves and to receive and share information regarding these issues, but converse as a community to collectively increase our political stance against these legislative concerns in Parliament regarding these Omnibus bills, and how these bills will impact other bills that are a concern for Canadians and First Nations. The event will begin at the Legislative Assembly building on Sat. March 1st 2014 at 1pm, where speakers will have prepared speeches regarding these issues, then a quick March to Portage and Colony ending with a round dance. Are you fed up with the feds?!?! Come bring your friends! Show that we are not going to just sit back and let this happen to our safety! 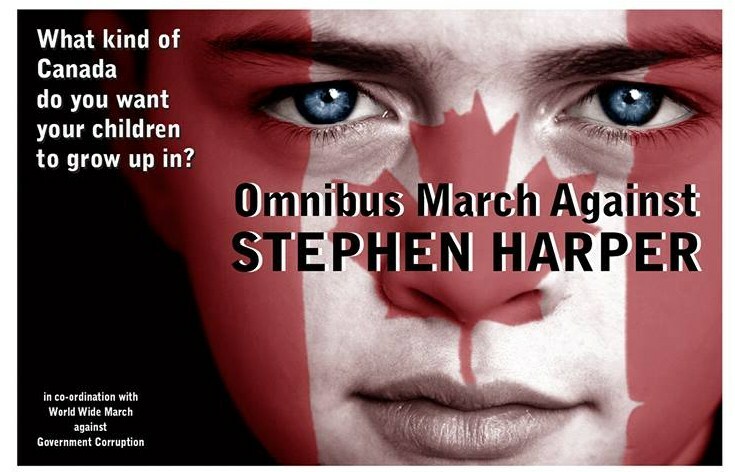 We need to stop Harper and if you fed up with him too you are not alone! Bring your signs what you want to tell Harper! Calling out all hand drummers! All activists! All community members! Make that change through unity, strength, and resilience! March 1st! * Mare Courchene will speak as an independent community member. Thats the line up ! George Munroe one of the National Indigenous Council of Elders NICE Movers n Shakers who are progressing with the CREATION OF WEALTH Educational Forum – Sustainable self-sufficiency through sharing, education and collaboration.